XOX AUDIO TOOLS brings high design and advanced technologies to the musical field to produce seductive musical instruments. XOX Audio Tools started in 2006 from a meeting between a musician with a background in sales and marketing, a famous product designer, and two engineering and manufacturing experts. "It all began with the quest to make a better guitar for the guitarist, better playability, better tone, better sustain, better resistance to the elements, better ergonomics. Having identified a material which greatly improves tone, sustain, and structure, over wood, I began exploring designs which could satisfy all aspects the guitarist desired in his dream guitar" states Peter Solomon, Design Director and CEO of XOX Audio Tools. "I wanted to create a new formal language for this guitar that would express its cutting-edge and innovative essence while also paying homage to certain elements of iconic electric guitars in order to create a comfortable familiarity for musicians. I delineated a sleek and organic form with distinctly carved out areas, but also something which felt like a guitar, and not an alien spaceship" stated Peter. 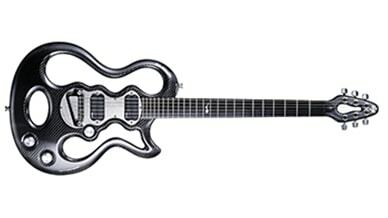 “Our mission was the development of a completely new electric guitar, different from any other previously seen models, not just a music instrument but also a seductive object characterized by its unique design and by the use of cutting edge technology and materials such as carbon fiber” explains Paolo Storti, Marketing & Sales Manager. This is never a minor challenge, considering there are not a lot of new ideas and features in the musical instrument field. “XOX will never produce a copy of another instrument. We are innovators and will always lead the way by designing our instruments from the ground up” continues Paolo Storti. “Our ideas are inspired by the musician’s needs, what does he really want from his instrument? From there, using our experience, fantasies, and new technologies, we project the highest level of instruments for the connoisseur. Paolo Storti adds: “It was important to find the ideal shape not just in terms of aesthetics but also in terms of functionality and performance.” The goal was achieved with the Handle, a revolutionary electric guitar. Create a completely new electric guitar that looks as good as it sounds. Use Evolve to model the smooth organic shapes required to create a beautiful and unique design. A true high-tech design object, the Handle combines a striking formal identity with cutting edge technology. Its mono-chassis, hollow-sectioned construction favors direct transmission of acoustic vibrations and creates a resonance chamber for incredibly rich warm sound. the Handle is made from carbon fiber, a material developed for the aerospace industry and used in F1 race cars. This ultra lightweight material is incredibly resilient and will not bend or deform when subjected to high temperatures or humidity. Also, carbon fiber offers a much wider harmonic range than wood. the Handle was conceived as a single body from which superfluous material has been removed. Its concave form, thin profile, slim neck and light weight offer a truly pleasing experience to anyone who plays it. the Handle was the winner of several awards including the Chicago Athenaeum Museum’s Good Design Award 2006 and Guitar Jam Daily’s Most Innovative Guitar of NAMM 2007, and Best Guitar of NAMM 2008. The Evolve 3D model was directly sent to rapid prototyping for the creation of molds. Thanks to the high quality photorealistic renderings, XOX Audio Tools could evaluate finishing alternatives and make the best choice. XOX Audio Tools bring high design and advanced technologies to the musical field to produce the most innovative and seductive instruments ever seen. All XOX Audio Tools instruments are designed in Italy and made to the highest world wide industrial standards. Interested in giving the solidThinking Suite a test run? Request access to a free 15-day trial of the solidThinking Suite. Want to explore a purchase of the solidThinking suite for yourself or company? Request a free, no obligation quote. Have a question about the solidThinking suite? Let us know how we can help. Learn about product training, news, events, and more.